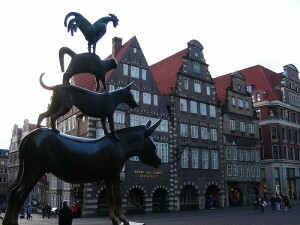 A statue of the stacked animals from “The Town Musicians of Bremen” is a landmark in Bremen. Photo by Chelsea Bissell, USAG Bavaria Public Affairs. GRAFENWOEHR, Germany — Americans owe Germany for some of our most beloved fairy tales. “Snow White,” “Rapunzel,” “Cinderella,” “Hansel and Gretel,” “Rumpelstiltskin” and “Sleeping Beauty” all come from Germany’s famed fairy tale scribes, Jacob and Wilhelm Grimm. While these are the most renowned tales in the Brothers Grimm canon, the prolific writers produced scores of stories that didn’t pick up steam in the U.S., but are popular in Germany. To celebrate the Grimms’ contributions to Western lore, die hards have created the German Fairy Tale Route. Starting in Hanau and stretching to Bremen, visitors can see where the Grimm brothers lived and worked, and gathered inspiration for some of their stories. But before you head off on your fairy tale tour of Germany, familiarize yourself with some Grimm stories every German knows. Four old and mistreated animals — a donkey, dog, cat and rooster — run away from their owners to save their lives. They plan to walk to Bremen and live as musicians. Along the road, they come across a robbers’ house in time to see the group of bandits sitting down to enjoy a meal. Hungry and tired, the animals decide to scare away the robbers. The dog stands on the donkey’s back, the cat on the dog’s and the rooster on the cat. Appearing tall and menacing, they break through the cottage window and the terrified robbers run away. After eating their fill, the animals fall asleep. One robber, thinking the coast is clear, enters the house and is immediately attacked by the animals. Running back to his comrades, the thief tells them he was attacked by a witch (cat), ogre (dog), giant (donkey) and judge (rooster.) They flee, leaving the house to the animals. A poor fisherman who lived with his wife in a filthy shack by the sea caught a flounder. The flounder turns to the fisherman and tells the man that he’s an enchanted prince. The fisherman, impressed by the talking fish, lets him go. When he tells his wife about enchanted flounder, she orders him to go back to where he caught it and ask for a cottage. The man reluctantly returns, finds the flounder and issues his wife’s request. He returns to his shack to find that it’s transformed into a quaint, well-stocked cottage. But now, his wife wants a stone palace. She orders him back to the flounder with this new demand. Once again, the flounder complies and the couple enjoys marble floors, delicious food, fine wine and wealth. But, the wife wants more and orders her husband to ask the flounder to make her king, then emperor, then pope. The flounder grants every wish. Finally, she asks to be God. When the flounder hears her last request, he turns her papal palace back into the grimy shack. Ironically named, “Clever Hans” is a comical story of a foolish boy named Hans and his fiancée Gretel. Every morning, Hans tells his mom he’s off to see Gretel to ask her for a gift. Gretel gives him, in order, a needle, knife, young goat, bacon, a calf and eventually herself. On the way home each day, Hans bungles his gift. On the first day, he puts the needle in a haystack. His mom reprimands him, saying he should have put it in his sleeve. When he gets the knife, he puts it in his sleeve and loses it. His mom says he should have put it in his pocket. The next day, the goat goes in his pocket and suffocates. The mom recommends putting the goat on a rope. So, he ties a rope around the bacon the next day, dragging it behind him and dogs eat it. His mom tells Hans he should have put the bacon on his head, so he does this with the calf the next day. The calf kicks him in the face and runs away. His mom tells him that the calf should have been tied to a cart. When Gretel gives herself to Hans to take home, he ties her to the cart. Hans’ mom reprimands him, saying he should “cast his adoring eyes at her.” Hans, of course, misunderstands this. He cuts out his animals’ eyes and throws them at Gretel. Gretel, for obvious reasons, breaks off their engagement. A brother and sister run away together to escape their brutal stepmother, who is also a witch. While walking through the forest, the brother drinks from an enchanted stream that turns him into a deer. The sister places a golden garter around his neck and leads him to a cottage where they live together. A nearby king forms a hunting party and chases the brother for days; but the brother is too fast for the hunters. Finally, the king follows the brother to the cottage where he immediately falls in love with the sister and marries her. The sister and brother (who is still a deer) move away and live in the castle. A year later, the sister gives birth to the prince. Enraged by jealousy, the witchy stepmother brings her ugly, one-eyed daughter to the castle. Posing as a nurse, the stepmother kills the sister and dresses her daughter up to look like the murdered queen. For five nights in a row, the sister’s ghost comes into her old room to hold her baby and pet her brother. On the fifth night, the king sees the ghost, recognizes her as his real wife, and she comes back to life. To punish the stepmother and daughter, both are put to death. As soon as they’re dead, the brother turns back into a human and they all live happily ever after.